HDL levels lower than 40 mg/dL are considered a risk factor for heart disease, while levels of 60 mg/dL or higher are thought to be optimal. Omega-3 fats, for instance, have been linked to lower risks of age-related vision loss and dementia among older adults. 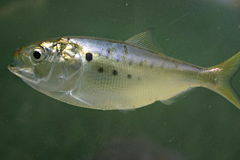 Nearly every fish a fish eater likes to eat eats menhaden (shown here). Bluefin tuna, striped bass, redfish and bluefish are just a few of the diners at the menhaden buffet. All of these fish are high in omega-3 fatty acids but are unable themselves to synthesize them. The omega-3s they have come from menhaden. Diet changes improve older adults' cholesterol too | Reuters. Image source: Menhaden B. tyrannus from the Chesapeake Bay. Wikipedia, Brian.gratwicke, Creative Commons Attribution 2.5 License.